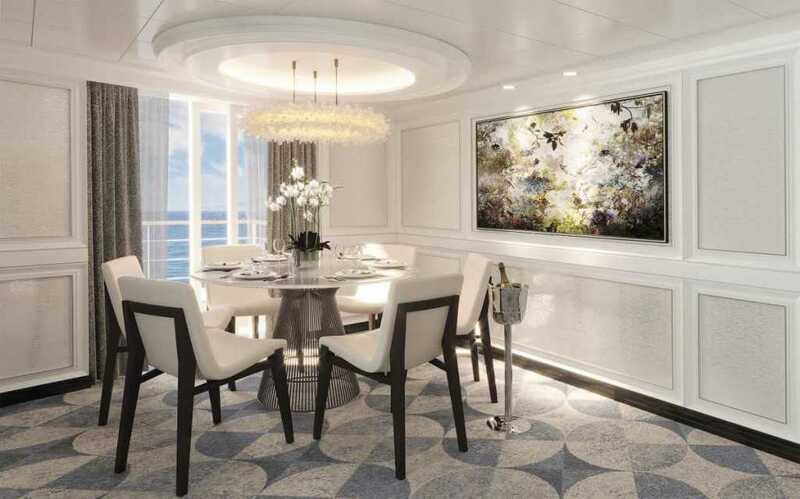 The Master, Grand, Splendor and Seven Seas suite categories represent the 32 Distinctive Suites on board Seven Seas Splendor. Guests in Distinctive Suites enjoy personalised butler service, guaranteed dining reservations and customised pillows and bath products, among other amenities. 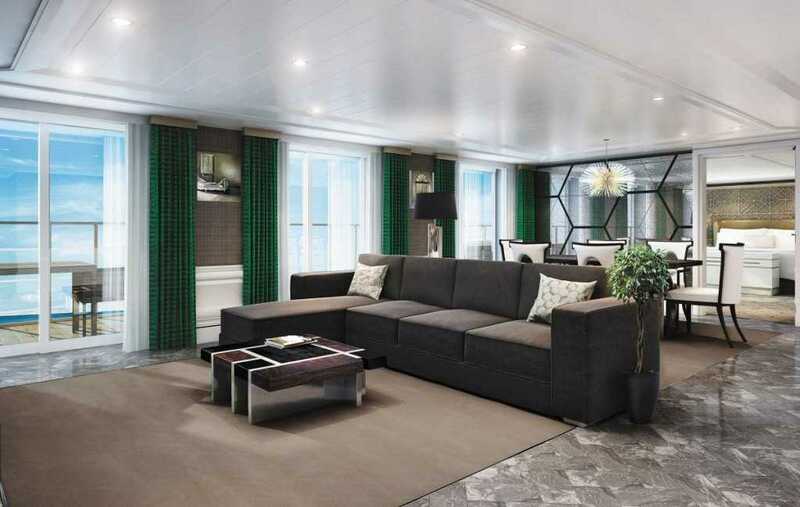 These suites are designed to blend comfort and luxury, focusing on impeccable details, exquisite high-contrast materials and lush jewel-toned accents. The suites are designed by Studio Dado, Tillberg Design, and Total Solution Interiors. and boast an expansive living area, exquisite bar for entertaining, spacious balconies up to 994 square-feet, and two full ornate marble and stone bathrooms. 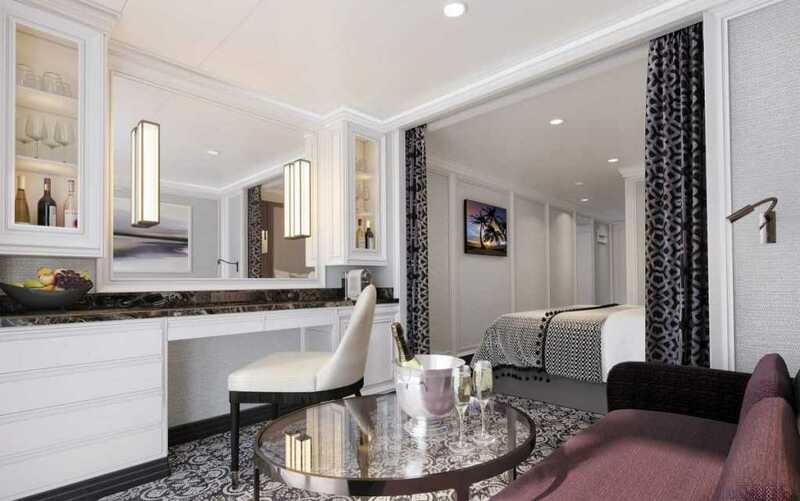 The Grand Suite features striking emerald design accents perfected by rich grey, brown, and cream tones. 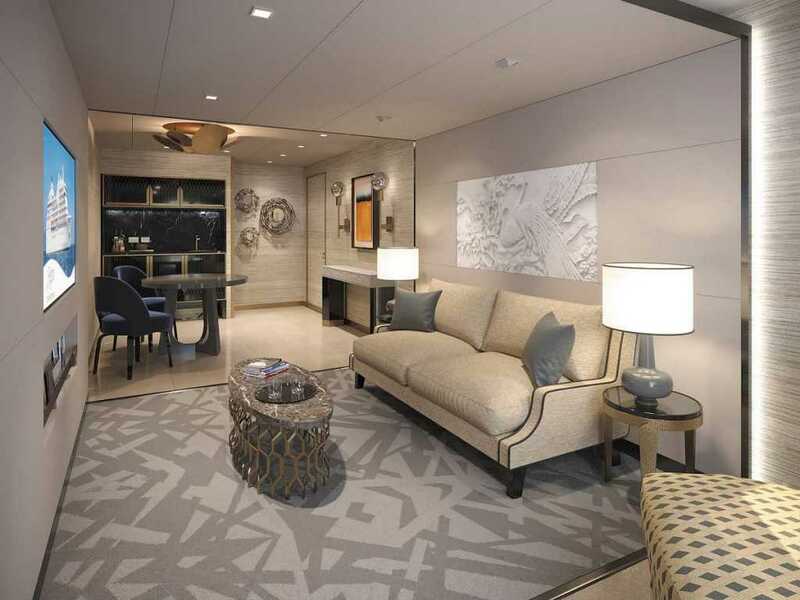 Ranging from 1,277 to 1,836 square-feet, the Grand Suite features an expansive private balcony, two majestic baths, and living areas with rich stone mosaics, exotic woods and curated furniture based on haute couture fashion. Craftsmanship is foremost on display with bespoke detailing, and an upholstered leather wall in an intricate stitch pattern serves as the backdrop for the bedroom. 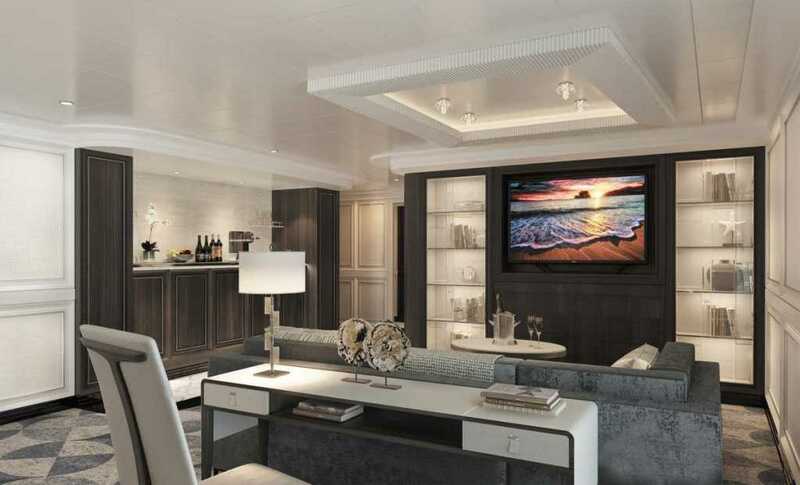 With ample space, the suite features a living room with a wrapped-leather floor-to-ceiling bar — ideal for entertaining. 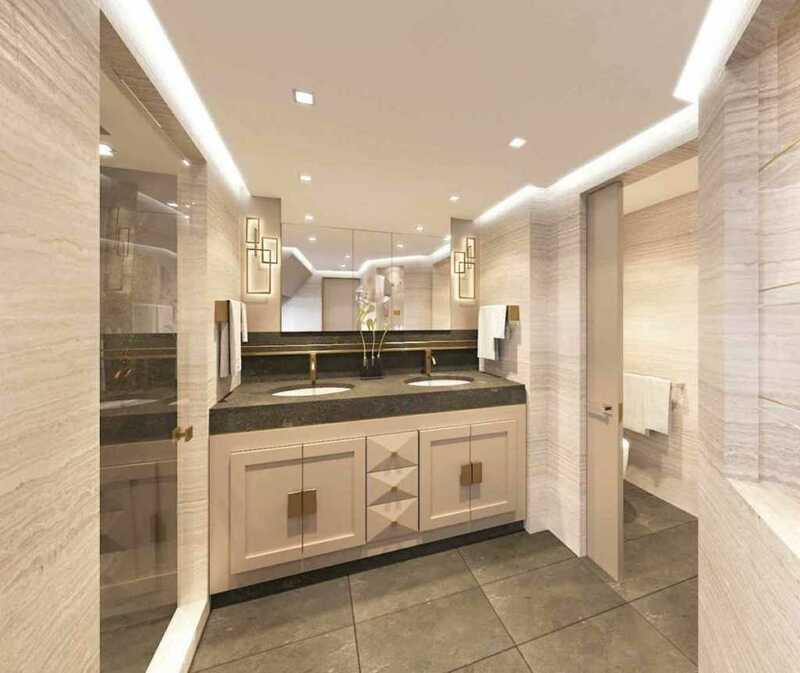 Ranging in size from 821 to 918 square-feet, the one bedroom, one-and-a-half-bathroom Splendor Suites are designed with calming hues of cream, grey and brown, and plush furniture. It features a dining table for in-room service, spacious closet, and an elegant marble and stone-detailed bath. This sanctuary offers more than 800 square-feet of exquisite space, and exudes a cosmopolitan apartment feel with a soothing colour palette complimented by plush furnishings. The suite flows effortlessly from living room to dining area to bedroom, with sliding glass doorways leading to a spacious private balcony. A magnificent marble bathroom sits adjacent to the oversized bedroom and large walk-in closet. The Penthouse, Concierge, Superior, Deluxe Veranda and Veranda suite categories are purposefully designed to maximise ocean views that can be enjoyed from the solace of a large private balcony. Along with the heavenly comfort of Elite Slumber beds, guests enjoy spacious closets, plush bathrobes and slippers, an included mini-bar stocked daily, and many other prime amenities. Penthouse Suite. Conjuring elegance from floor to ceiling and complete with personalised butler service, the 55 sapphire-inspired Penthouse Suites come in three categories that range up to 642 square-feet, with an entertainment centre that separates the living room and bedroom. Sleek sliding glass doorways in both the bedroom and living room lead to an oversized balcony with comfortable outdoor furnishings. Even the smallest of luxury details are included such as lined jewellery drawers to designated spaces for designer handbags. 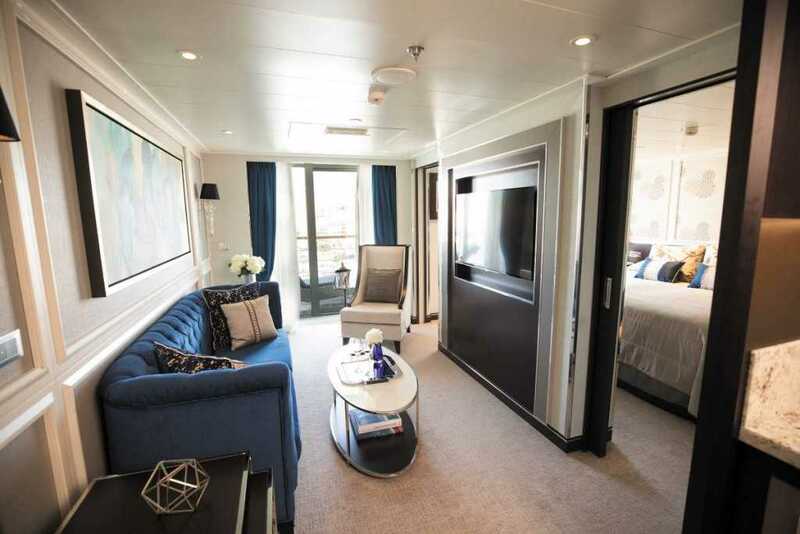 A perfected luxury from Seven Seas Explorer, Seven Seas Splendor’s sister ship, can be found in the closets. 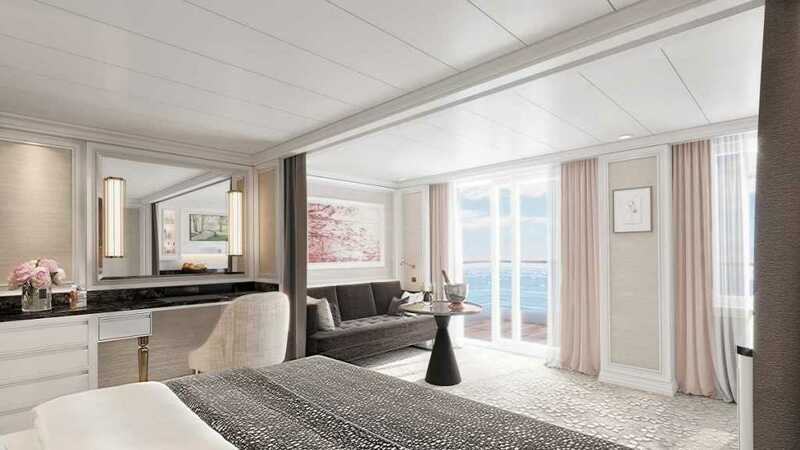 Penthouse Suites on Seven Seas Splendor will include larger expansive walk-in closets designed with two entries from the bathroom and living room. In addition, bathrooms have been designed for additional storage and counter space. Concierge Suites. Concierge Suites are highlighted by a soothing colour palette of creams and blushes that inspire serenity and comfort. 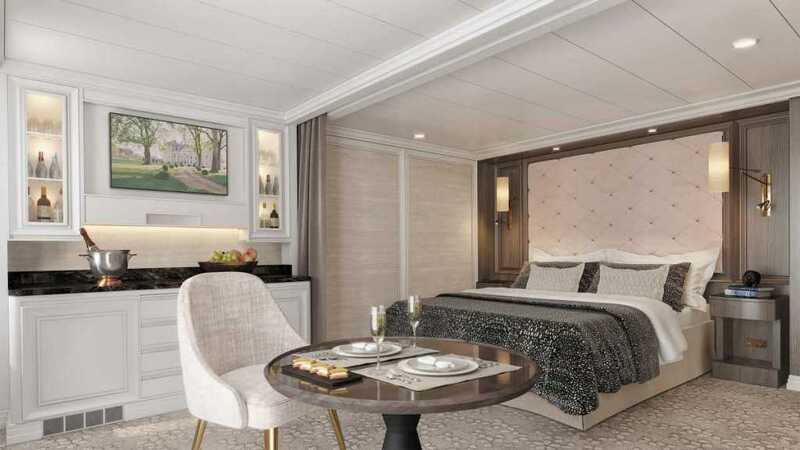 This 464 square-foot suite aboard Seven Seas Splendor comes in two categories and is purposefully designed to maximize ocean views, with the custom-crafted Elite SlumberTM Beds facing the private balcony, allowing guests front row access to stunning ocean scenery. Skilled master craftsmen adorn headboards with the finest shagreen leather, and furniture is upholstered with the most elegant Italian fabrics. Guests who stay in a Concierge Suite or a higher category suite enjoy a free one-night pre-cruise hotel package. 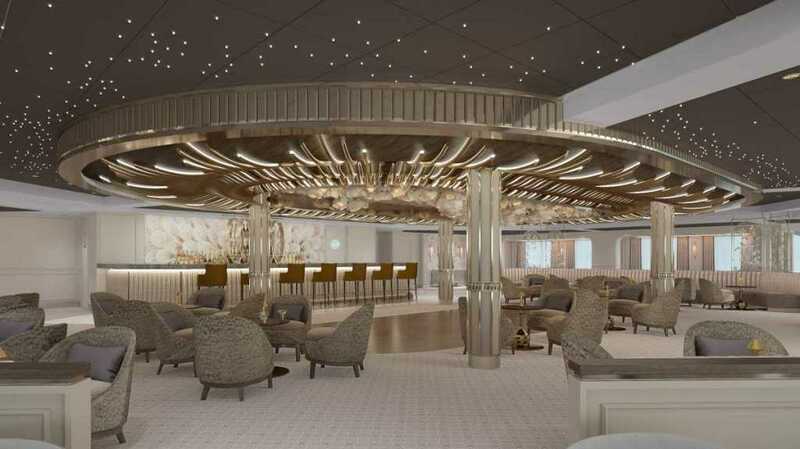 In addition to suite designs, Regent today announced the interior design of the Observation Lounge on board Seven Seas Splendor. The Observation Lounge inspires the feeling of an enchanting English garden. Incorporating a light and airy colour palette, the Observation Lounge’s centrepiece is a unique and stunning whimsical chandelier comprised of hand-painted porcelain flowers, peonies and roses. Traditional English architectural moulding adorn the walls and are coloured in neutral hues to create a contemporary, elegant setting. The furniture adds to the tranquil nature of the space through its soft curved forms and lush upholsteries inspired by the fluid forms of flower petals. Specially commissioned art by Gorman Studios incorporates hand-painted English roses and flowers on glass screens to reflect the look of porcelain chandeliers.